From Little Street, near the Old Meeting Baptist Church to Duck Street. 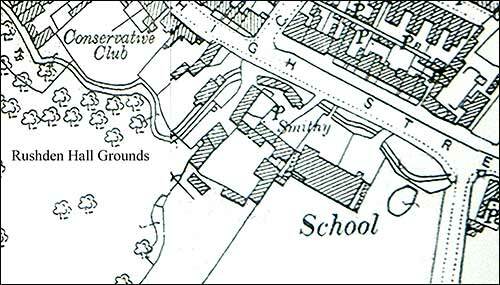 1900 Map showing the brook near the South End School, at the corner of High Street South and Wymington Road. Next door was Lewis' blacksmiths yard, house and smithy. The Sydney brook flowed along in front of both and then meandered behind the Conservative Club and into Rushden Hall grounds. A bridge gave access into the school playground. 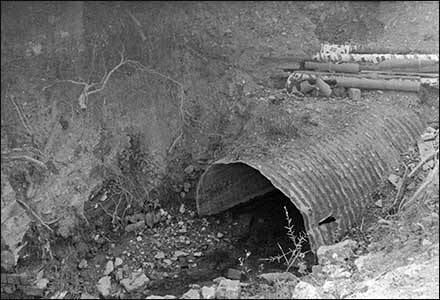 The brook along Duck Street was culverted in 1977; we have no pictures but do have a plan and a report. 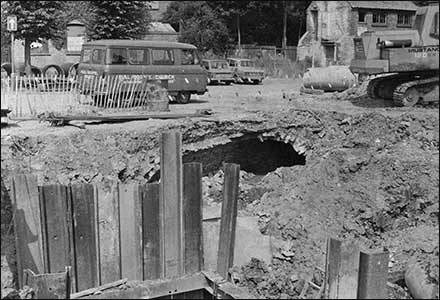 In 1968 severe flooding occurred in Duck Street, College Street, The Lightstrung, Skinners Hill and Mannings Street areas of Rushden with entry of water into residential and industrial premises. The former Rushden Urban District Council commissioned Messrs. L.G. Mouchel & Partners, Consulting Engineers, to carry out an investigation into the capacity of the main surface water drainage system (known as the Town Brook) which is situated in the valley which runs from south-east to north-west through Rushden and to which virtually the whole of the developed area drains. The Consulting Engineers' report presented in October showed that many sections of the existing surface water system had insufficient capacity to take flows arising from existing development from a storm of an intensity likely to occur at least once a year and flooding was likely to be a frequent occurrence. The Consulting Engineers were instructed to prepare proposals for enlargements to the main surface water system to deal with flows from existing properties and to permit further development in the southern part of the town adjacent to Bedford Road. 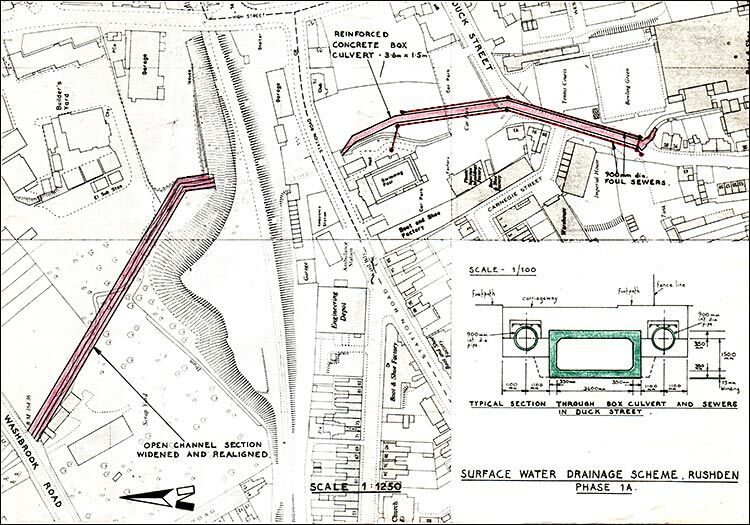 This entailed a comprehensive investigation of all surface water sewers throughout the town which drained to the Town Brook and in 1972 Mouchel & Partners submitted their second stage report on the necessary works. The report was accepted by the Urban District Council but the proposals to re-organise Local Government throughout England and Wales were then beginning to have an effect, although consultations with Government Departments and other interested authorities continued. 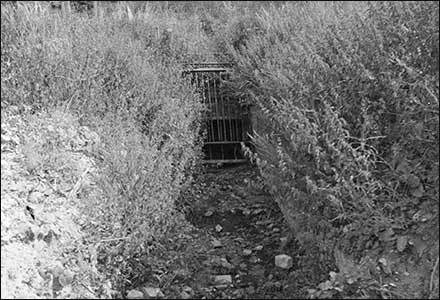 About this time, it became apparent that the trunk foul sewers which are situated in the same valley adjacent to the Town Brook were operating at full capacity and surcharging during times of heavy rain. 1. Surface Water Drainage Rushden - Phase 1A, which is the contract at present under construction. 2. Surface Water Drainage Rushden - Phase 2, which will be the completion of all the works necessary to the Town Brook. 3. Trunk Foul Sewers Rushden, which will provide additional capacity to the trunk foul sewers from Bedford Road all the way to the Sewage Treatment Works. Phase 1A of the Surface Water Drainage Scheme is described in more detail below, and Phase 2 will be amalgamated with the Trunk Poul Sewer Scheme to form one contract with an estimated cost in the region of £1 million. Design work is at present in hand and it is anticipated that construction will commence in November this year. This contract consists of the minimum amount of work necessary to replace the most heavily overloaded sections of the system and will give immediate relief to the properties which prior to the works were exposed to the highest risk of flooding. 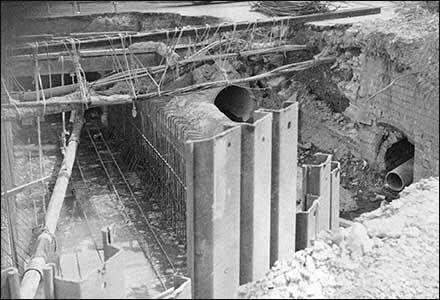 The new reinforced concrete box culvert is 3.6 metres in width and 1.5 metres in height (12 ft. x 5 ft. approx.) and, when Phase 2 has been completed, will be capable of carrying flows arising from a storm of an intensity likely to occur only once every five years. 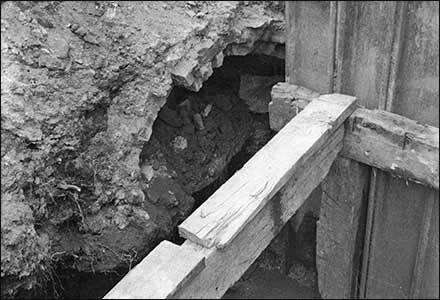 The culvert commences in Duck Street, outside No. 58, where it will pick up the flows from the present open channel system, and then pass through Duck Street, the car park and the Council owned land adjacent to the swimming pool where it will be temporarily connected to the existing culvert underneath Station Road and the railway embankment. 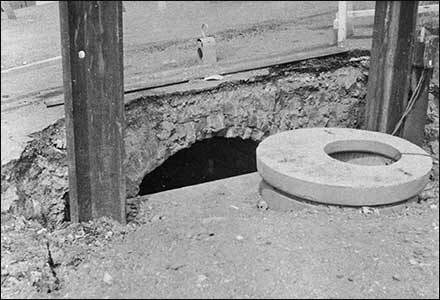 At the same time, the enlargement of the adjacent foul sewers is being carried out with the provision of a 900 millimetre (3 ft.) diameter pipe on each side of the box culvert and these will be temporarily connected into the existing foul sewers near the swimming pool. Also included in the contract is the widening and realignment of the open channel system between the railway embankment and Washbrook Road. The work is financed by the Anglian Water Authority and is being carried out by Kimbell Construction Ltd., Boughton, Northampton. The contract sum is £200,326.03 and completion is expected in October this year. The scheme was designed by Messrs. L.G. Mouchel & Partners, Consulting Engineers, Bath, working under the direction of the East Northamptonshire District Council's Director of Technical Services.